Hit and Run and/or Stolen Car? 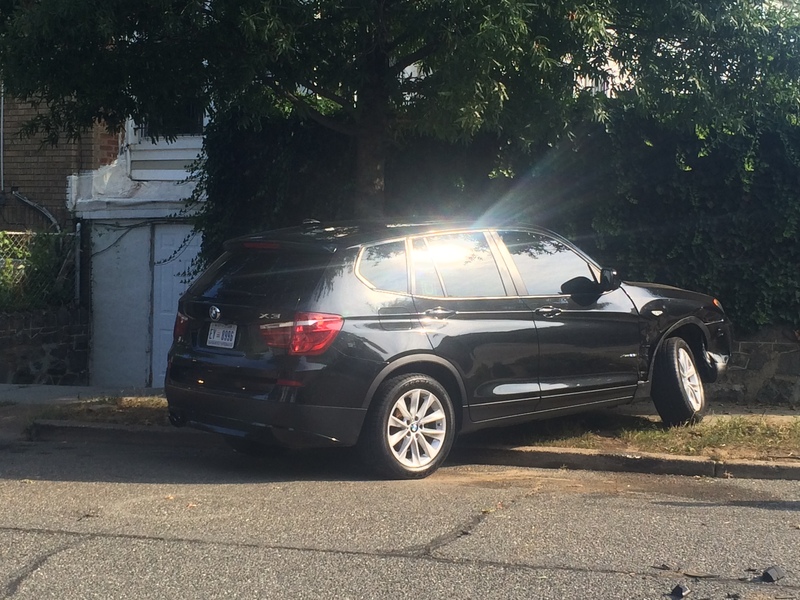 This morning a driver in a white Stratus with Virginia tags exited the alley behind West Virginia Avenue NE turned right onto Owen Place NE and rammed into a black BMW parked on the street. 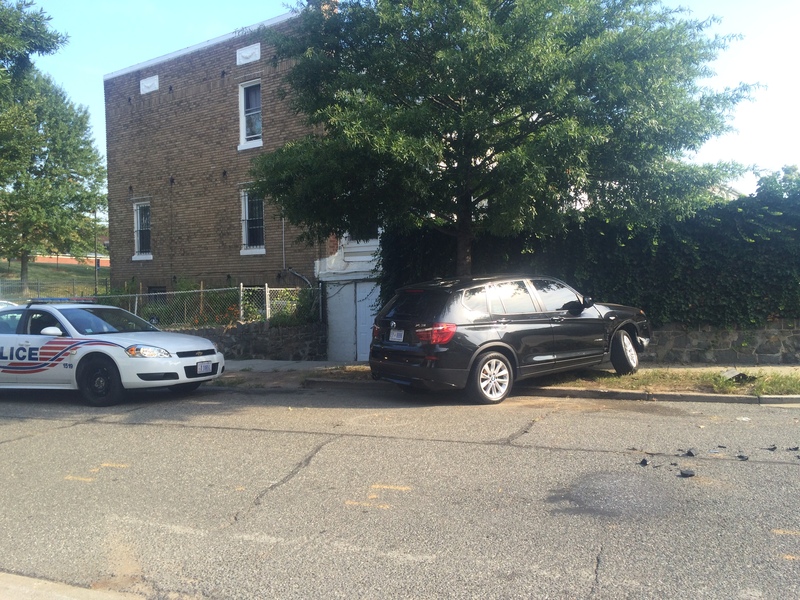 The black SUV was pushed on the sidewalk and into a tree. The driver fled the scene. Neighbors who were outside and witnessed the crash called 911. 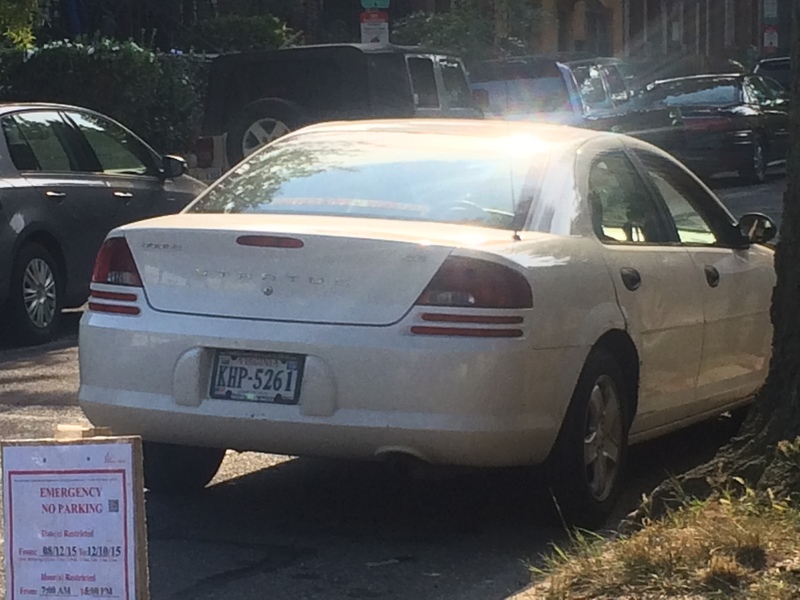 It is likely that the white car may have been stolen and then abandoned after the crash. No one was injured in the accident. MPD will be at the TNA regular August meeting tomorrow for a security update. Please join us and bring questions you may have for them regarding crime and crime prevention in the neighborhood. Also on the agenda are the Deputy Mayor for Greater Economic Opportunity and 405 Yoga (opening at FL Ave and W Va Ave). The meeting will start at 7 pm at the Trinidad Recreation Center on Childress Avenue NE. Join the team of volunteers led by the Mayor’s Office of Community Relations and Services (MOCRS) from 10 am to 1 pm today at the Wheatley Education Campus. Original post about the clean up is here. 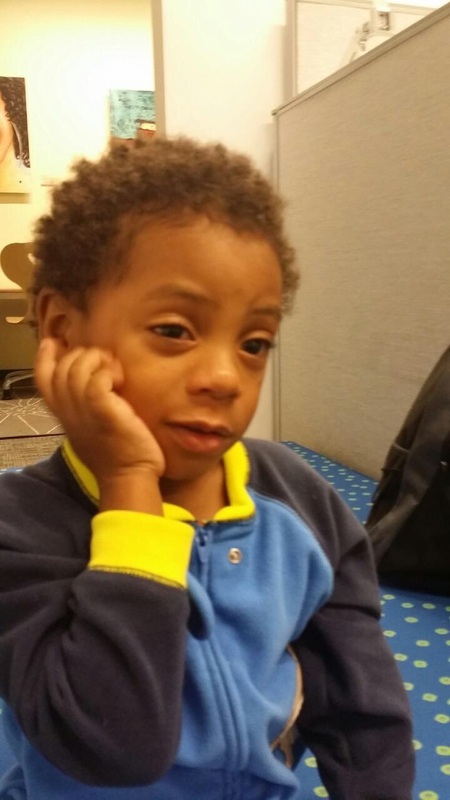 UPDATE: MPD reports that the child has been identified. 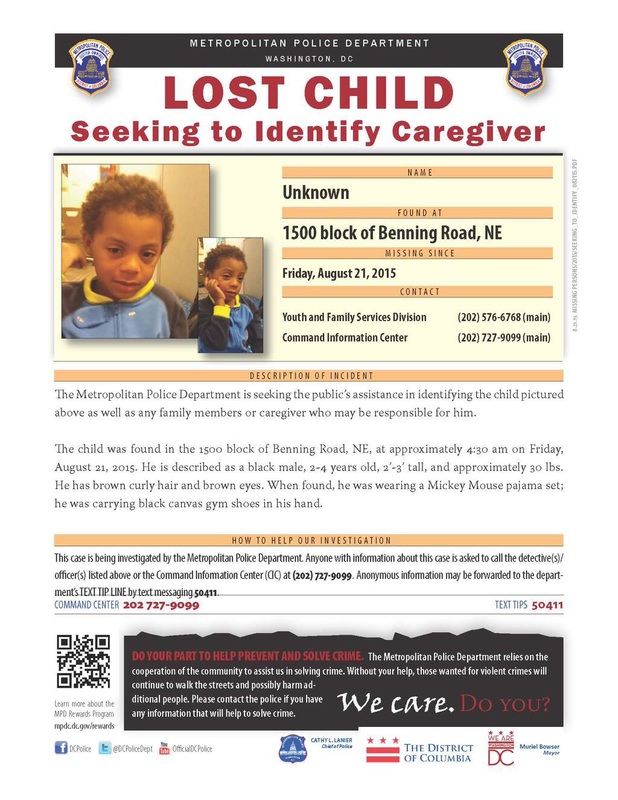 ORIGINAL POST: Metropolitan Police Department found a child in the 1500 block of Benning Road at 4:30 am and are seeking assistance in locating parents or guardians. If you know the child, parents, or guardians please call (202) 727-9099 or text 50411 if you wish to leave an anonymous tip. WUSA 9 also covered this story. See the link for details. Step Afrika! kicks off their 2015-2106 season with a free performance starting at 8 p.m. on Friday, August 21 at Starburst Plaza. Artists from Step Afrika! will be joined by DJ Beauty and the Beatz for a high-energy demonstration of the art of stepping. Expect to join in with footsteps, claps, and spoken word as audience participation is encouraged. Starting from an exchange tour to Soweto, South Africa, Step Afrika! is now one of the top 10 African American dance companies and the largest African American arts organization in DC. Don’t miss the show, especially if you have not had the opportunity to see them perform. It is great that Starburst Plaza is seeing more positive events with organizations like this that use art to reach out to youth and families. We hope you can join Step Afrika! there as they celebrate 20 years of stepping. The new studio’s owners will be at our August TNA meeting to tell us more about 405 Yoga’s ASL yoga partnership with Gallaudet and work with Veteran’s Organization ‘Red, White, and Blue’. 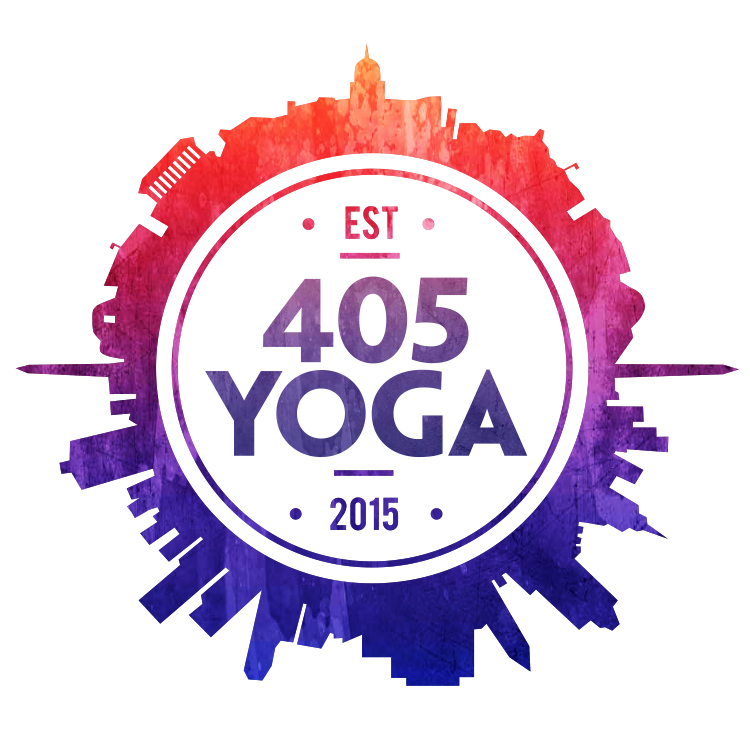 405 Yoga – New Yoga Studio opening Fall 2015 at the corner of Florida & West Virginia Aves. Before kids head back to school, the Mayor’s Office of Community Relations and Services (MOCRS) and your ward 5 team are hosting a volunteer day to help get our schools ready for the students. if you are free on Saturday, August 22 please consider coming out to clean up the school. Sign up HERE to let Tommie & Malik, our Ward 5 MOCRS liaisons, know if you are able to participate. You can also donate unused school supplies or K-8 children books. On August 6, 2015 we posted about the ANC Recall Process. As petitions are being circulated it is important that Trinidad residents understand the impact the recall will have on the Trinidad neighborhood. Currently Trinidad has 3 Single Member District Commissioners. The petitions being circulated will cause vacancies. The recall will disproportionally impact our neighborhood. 3,470 registered voters may lose representation. Trinidad currently has 3 votes on the 7 member Advisory Neighborhood Commission 5D, but the recall will leave us with only 1 vote. As many of you know there are multiple development efforts, liquor license protests, zoning matters, and community engagement projects underway. TNA does not have a position on the merits of the petitions, but we want all in the Trinidad neighborhood to think long and hard about the impact of the recall on our neighborhood. Lastly, we would like to remind our neighbors that all ANC Single Member District Commissioners are up for reelection in 2016. As always we encourage competitive races at the ANC level, and challenging the incumbents at this time does not risk a loss in representation.